I've been a vegetarian on & off - mostly on - for 26 years. The decision wasn't so much because of the health benefits for me but because I love animals. Yet I continued to consume dairy & eggs even though in the last few years I've heard more & more about the cruelty of the dairy & egg industries. I chose to turn a blind eye to this cruelty, telling myself it was enough that I'd given up meat. The day I visited Peaceful Prairie Sanctuary & met some of the victims of agribusiness was the day I decided I could no longer turn a blind eye to their suffering. My good friend Monika Courtney had heard the sanctuary was badly in need of blankets for the pot-bellied pigs & also any sick or injured critters. Never one to pass up a chance to help animals, Monika collected a huge pile of blankets. I asked if I could ride along with her when she dropped them off. I'd heard of the sanctuary & thought it would be fun to visit the animals. Before going, I took a look at the website. Clicking on the "Meet the Residents" link I read the sad stories of just a few of the victims of the meat, dairy & egg industries. The most heartbreaking was the story of Champagne, an adorable baby goat born on a goat cheese farm. Ripped from her mother at birth so her mother could be put into milk production, she died a couple of weeks later. It struck me as it never had before that the simple act of buying milk or cheese at the grocery store has very real & tragic consequences for the animals. When Monika, her kids Kevin & Sarah, & I arrived at Peaceful Prairie we were met by Michele Alley-Grubb who with her husband Chris own & operate the sanctuary. Though she must have had a hundred other things to do she kindly took the time to show us around & introduce us to the many animals who came forward to meet us. Goats & sheep, pigs & cows, chickens & turkeys, innocent creatures who had known little but suffering at the hands of humans had learned to trust again, thanks to the compassion of Michele & Chris. We met Michael, a billy goat who had spent his whole life chained to a tree on a dairy farm. The chain had become imbedded in his neck & the scar was still visible. Yet he had overcome his fear of humans here at Peaceful Prairie & now was as friendly as could be. We met Oscar the pig who followed us everywhere, rubbing against us & vying with the others for our attention. Most impressive to me was Sherman, a gentle giant of a steer. He's so huge he could inflict some serious harm if he wanted to. But he came & stood before us like a friendly puppy begging to be petted. As we interacted with these & other animals it was so clear that they were not pieces of meat, or milk or egg producing machines. Each was an individual with his or her own unique personality, in this respect not so different from dogs or cats - or humans for that matter. Before we left, Michele pointed out in her soft-spoken way that there are so many things in the world that we have no control over, but we DO have control over what we eat. We can choose cruelty or we can choose compassion. I decided then & there to choose compassion from now on. 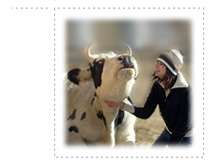 And thanks to Peaceful Prairie Sanctuary it's now clear to me that the most compassionate diet is a vegan diet.